4.0 out of 5 based on 112 bloggers and 46 commenters. 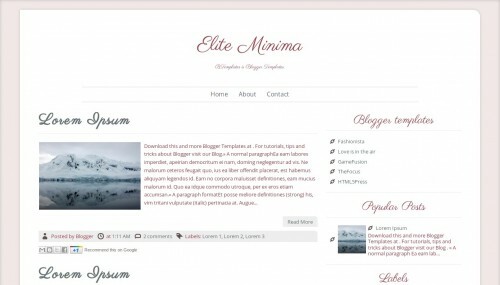 Elite Minima is a free blogger template with 2 columns, right sidebar, minimalist, footer columns and simple look. Its what was looking for… thanks for your talent! Simple but cute!!! :D I have downloaded it..
Ok, I must say this is the most horrible template I’ve ever tried. Looks pretty, but really hard to work with! And I could find so much more ..
Don’t forget to save your old template when trying this one, you’ll understand why after trying. so I delete the code “max-width: 100%;”. in addition I change “auto” to become fix size; “width:200;” “height:150;”. And all is working fine at mine. Is there any way to reset the pictures? And get a date added to the time? Very nicely designed.But there are some functional issues that should be addressed. The text and links overlap on top of your pictures and images. It’s challenging to resize it. Very not user friendly. Great font features though. but resizing the pics is a challenge.anyone have successful to change it? do share with me. This is great but i want dates to be shown per post..any idea on what code to add? Thanks! Do you know how to get the dates shown per post? Hello! I like this template and i am using on my blog, but i have a problem with the Page List. He disappeared and i don’t know what to do! – how can I display the date of the post instead of only the time? – where can I find the css code to change the size of blog description? – how can I change the font of the post? Thank you, love this template! I uploaded this template today. Everything is working, except page layout..it is not working right on home page, everything coming under blog post. Other pages it is working fine. I install this template and work just fine. No problems at all. Love it, very good. So good that i return here to say to everyone. I love this template and am using it at my blog. I am wondering if there is any way to change it so that the full size post shows up(more like the traditional blogger format), as opposed to the abbreviated posts. Also, is there a way to show the date of the post? Thanks again for this great template. Does anyone have a problem with the reply button on comments? Thank you for this template. I have found it easy to implement and customize. Unfortunately the template isn’t allowing comments unless the user goes to the comment box; the “reply” and “comment” links don’t work. I get an error “Unterminated string constant”. I would sincerely appreciate any help in fixing this error. I have been using this template now for several months and love it. Just today, though, my page titles at the top disappeared (my blog naviagation.) Has this happened to anyone before? How do I get them back? Pleast let me know if there is a way to show the full blog post on this template, and if I can have the date show on my posts. Thanks! Those All Having problem with this template can use PANADA template fastest and Mst elegant template I have ever seen.. I really wish we could choose which picture to display for the preview instead of the very first one. Love the design though. Downloaded this and thought it was great, customized everything. Yet, I wanted to go back and tweak it but the customization is set and I can’t change anything. Not even through the HTML coding. This is a one-time customization template. BE CAREFUL! I take back what I said ABOVE. The template works in the blogger customization, only if you ENABLE MOBILE setting before downloading this template onto blogger. Tweak all your colors via blogger and tweak the HTML codes if necessary. After all is done and you think your blog looks right, disable mobile setting. All should look good on computer and any mobile device. If you want to change the color or any lettering, you have to download the template again onto blogger and start all over. I want to remove that gray icon that appears before the title and figures on the list of blogs, how do I remove? can someone send me the html code list for this , as my computer wont let me load it !! its really annoying !! I had the same problem and had someone correct the code for me for a small fee. I was able to have someone correct the code for me for a small fee. So now my reply feature works correctly. I’ve had this template for a little over 2 weeks. It worked and looked great at first but now that I’ve published 6 new posts, the main page suddenly only shows 3 posts. It will not show more than 3 on the main page no matter how many times I change it. It will show less but no more than 3! Can someone help or do I have to start over with a whole new template?! How do I add the date, as now only the time posted shows on the blog? Does anyone can help me with the coments? the template does not give the coment option after de post even when it is set to do so.